The Metalworking Projects and Plans Book (volume 1 benches) shown above to the left is very useful book if your looking for detailed specific plans on how to build some attractive benches. This book is the first in a series of books we are working to develop, to make your fabricating results more fruitful. These plans are designed primarily to be utilized using Shop Outfitters’ tools and PlasmaCam’s cutting table. Making use of the Lock-N-Stop Gauge (which is part of the UB-5, UB-5H Universal Bender and the UF-25H Universal Fabricator) takes the guess work out of fabricating these benches and other projects you may want to build. Without this patented gauging system that’s only available on Shop Outfitters’ machines, forming the parts for these benches would be a hit and miss proposition. If you have some other type of bender, other than Shop Outfitters, you may still find this book useful as a reference guide for ideas only. You may have a PlasmaCam cutting table, but have neither our Universal Bender or our Universal Fabricator. If you have some bending capability, you may be able to make some of the benches in this book that require a minimal amount of bending. PlasmaCam’s artwork (available on disk for use on their machine) was used in almost all of the benches shown in this book that actually employs silhouette artwork. About half of the benches, shown in this book, use silhouette cutouts as embellishments. The other half were made using formed square or round tubing, most of which are embellished with ornamental scrollwork. If you’re contemplating purchasing a different bending machine you may want to first consider its possible limitations. While some machines may have a larger bending capacity, the UB-5H and the UF-25H cover a fairly broad range of bending capabilities. More importantly, they have a gauging system that allows for recording and making repeat bends. Besides, a lot of unnecessary work suddenly becomes very necessary if you’re using a bender that has no gauging system that directly correlates to any available metalworking plans. Shop Outfitters’ machines, have a patented gauging system that directly correlate to all of it’s plans, making building projects much easier. Several thousand hours have gone into making the benches and plans for this book. The amount of scrap alone, that you can save following these plans, makes the book a real necessity. 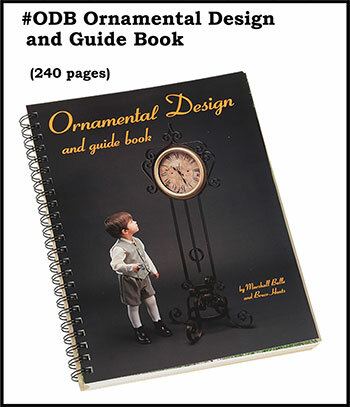 The Ornamental Design and Guide book shown above to the right, is an idea book only and does not give specific building instructions as does our new detailed plans bench book. However it can serve as a reference book when you’re simply looking for additional ideas. Most of the items shown in it, were contributed by various welding shops and some blacksmiths. 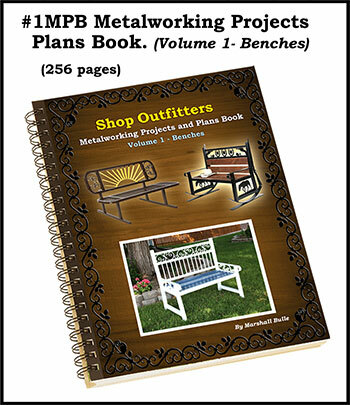 Shop Outfitters’ Metalworking Project and Plans Book (volume 1 Benches) has come about because of the large number of request we’ve gotten over the years for specific plans for metalworking projects. We decided to make our first plans book on benches because almost everyone has a use somewhere for a bench. This recently completed comprehensive book is just the first in a series of plan books we are working on to make available to our customers.